Follow the yellow brick road with The Flaming Lips and special guests to a land enchanted by classic Beatles tracks. You’re not in Kansas anymore.. 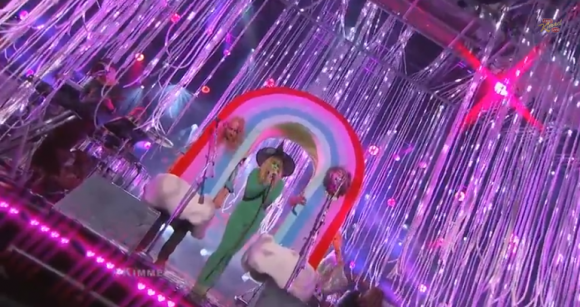 The cast from The Wizard of Oz were on Jimmy Kimmel on Halloween dressed up as the Flaming Lips…or was it the other way around? It was a very interesting scene, with light strings dangling and rainbows flashing, and a Fender Jazz Master painted as green as the jumpsuit worn by Grace Potter, who dropped in to give a little help to her friends. Vocally, she is the only one who seems to be singing in the right key at first, and adding the inflections that we know her for. Wayne Coyne takes literally the hypothetical posed in the original song: “what would you think if I sang out of tune” and Morgan Delt on the left has a static effect processed through his mic that adds a white noise to his voice. The accompaniment was superb; John Bonham style drum fills and phenomenal bass playing made their satirical situation that much more enjoyable. The static voice filters work better on ‘Lucy In The Sky With Diamonds”, and the long drawn out synth passages build up a nice anticipation to Grace Potter’s chorus, which she first screams then sings beautifully; the music slows a bit after the chorus in a momentary hiatus to reemerge similarly to how the song begins for the second verse, and once again Grace Potter’s screams are foreshadowed by an erie synth break. Grace Potter’s climax at the end was fantastic, as she loses her hat and bounces around screaming. It is definitely a weird performance, but given the fact that last weekend was Halloweekend, it only seems fitting. The Flaming Lips release of the track for track cover album of the Beatles’ ‘Sgt. Pepper’s Lonely Hearts Club Band’, is aptly named ‘With a Little Help From My Friends’. Each track features a different fwend or in some cases different fwends, in fact there are so many that the album cover could’ve looked like ‘Sgt. Pepper’s’ if they had taken a group shot of all those who collaborated. In the group would be the likes of Tegan and Sara, Stardeath and the White Dwarfs, Foxygen, Moby, Miley Cyrus, Doctor Dog and My Morning Jacket. Check out Consequence of Sound‘s article and their ensuing review of the album itself! The Flaming Lips are in familiar territory choosing to do a cover album track by track. ‘The Flaming Lips and Stardeath and White Dwarfs with Henry Rollins and Peaches Doing The Dark Side of the Moon’ was released in December of 2009. For more info on the release of their new cover album, check out our other coverage.